Horizon picking is a feature that INTViewer has included from the start. However, after discussing with several long-time users, I have found that the evolutions brought by each release can be missed. The release of INTViewer 5.2 is a good opportunity to tour basic picking options. First, a bit of terminology. The term “horizon” in geoscience is often a generic term for surfaces. In INTViewer, “horizon” is a surface that is typically defined by trace number or INLINE-XLINE as opposed to X-Y. 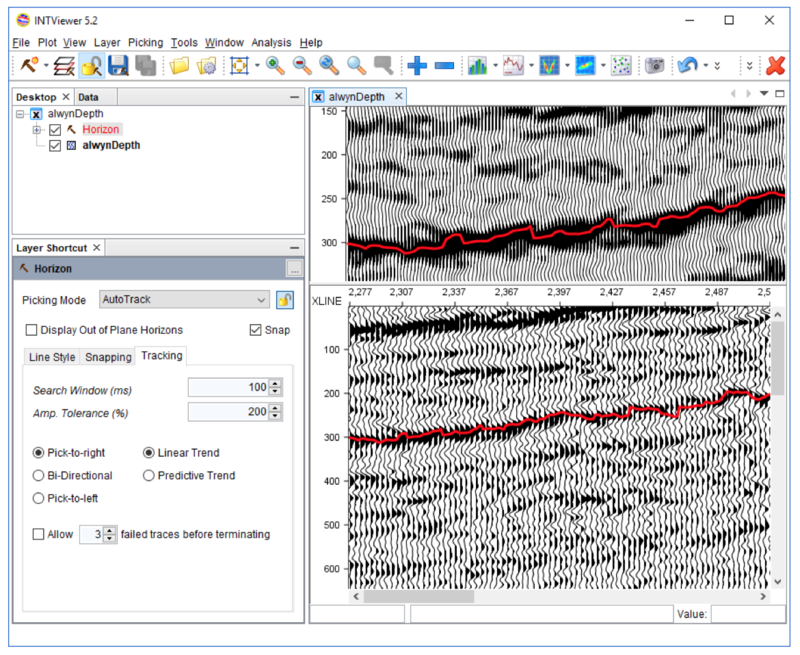 In INTViewer’s lingo, surfaces defined in X-Y are “grid surfaces” if they follow an X-Y grid. If they don’t follow of well-defined grid, they are “Gocad” or “Triangle Mesh” surfaces. 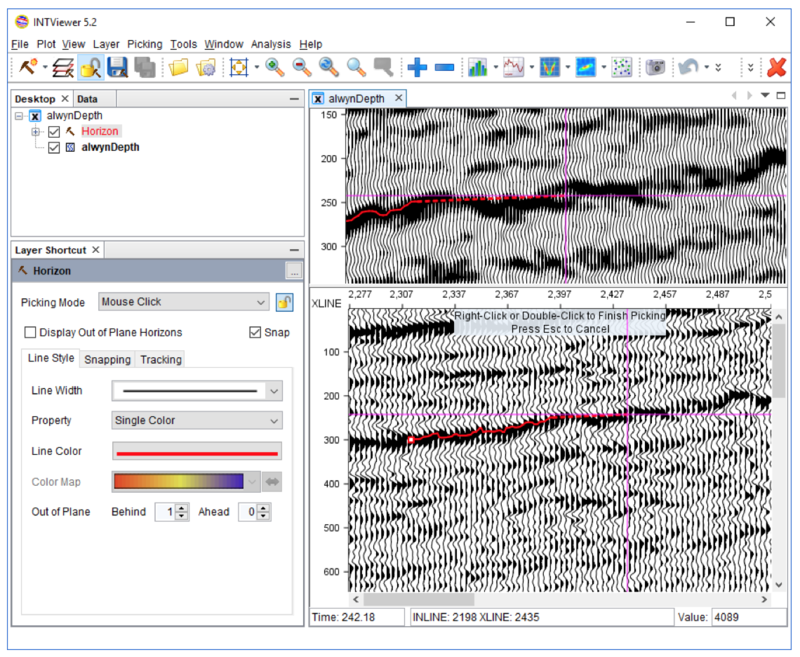 The “grid” of an “horizon” is the grid of the underlying seismic dataset. 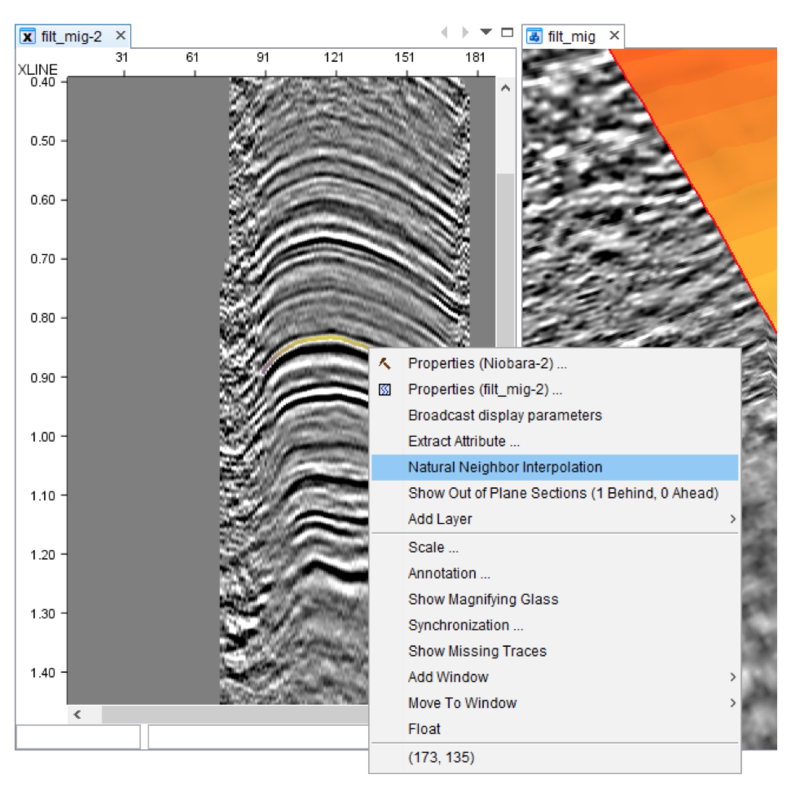 Users can work with horizons on 2D datasets, 3D volumes, and gathers. When it comes to editing horizons, there are three picking modes available: Mouse Drag, Mouse Click, and AutoTrack. The layer shortcut window giving quick access to all horizon options. The Mouse Drag picking mode is the default and lets you draw continuous lines across a XSection. 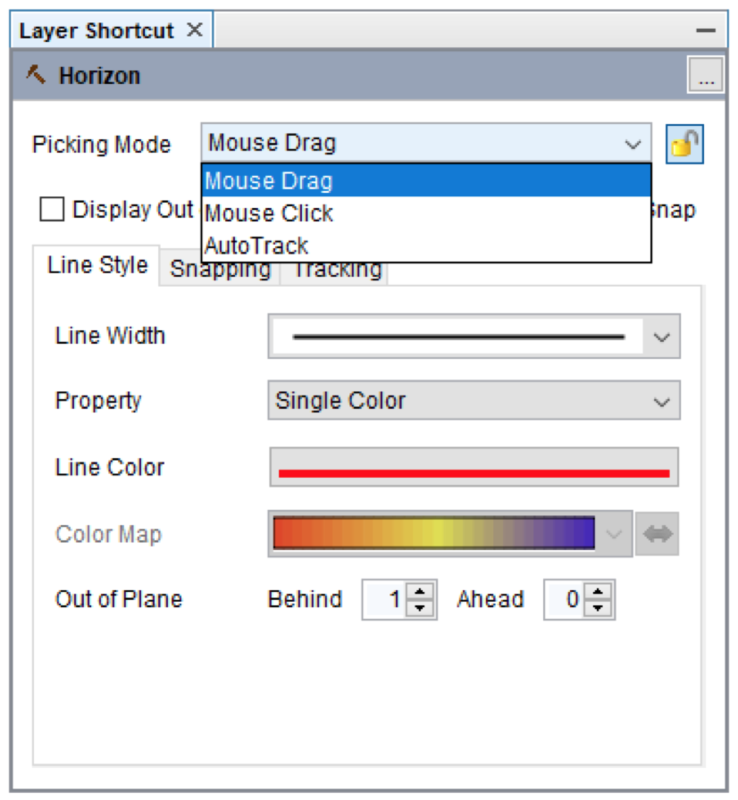 An example of picking using Mouse Drag. Mouse Click is a faster picking mode as you only need to pick a few points. After you release the mouse, the traces between the last two points are auto-picked. An example of picking using Mouse Click. AutoTrack is the fastest picking mode as it will pick across the entire section visualized on screen. An example of picking using AutoTrack. Users are not limited to one picking mode. Keyboard shortcuts let you switch modes interactively as you are picking points. 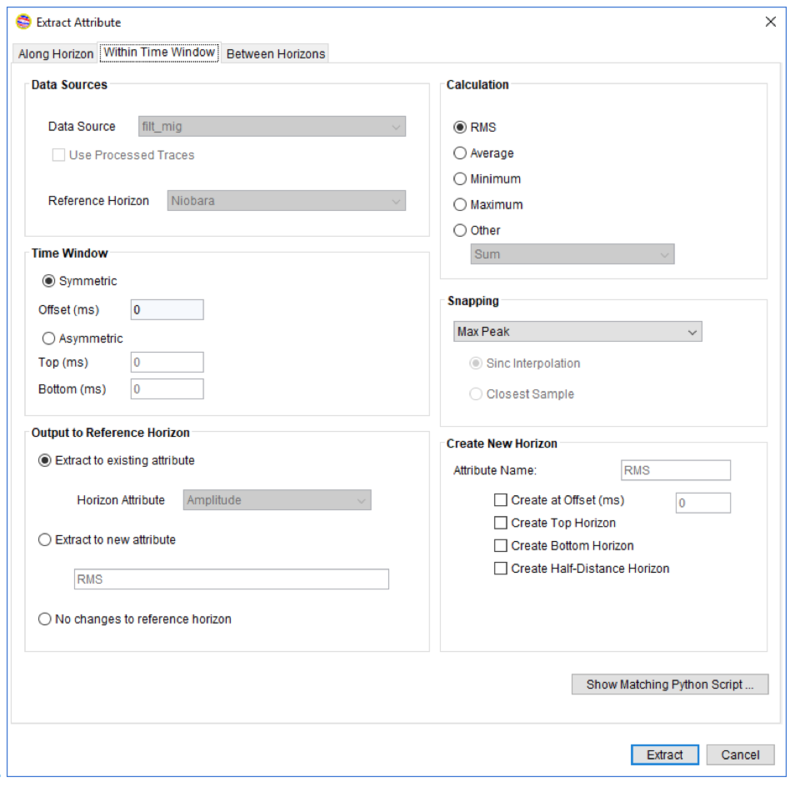 You can elect to “snap” picks to peaks or troughs and sample measurements are affected by default by any trace processor that might be applied. 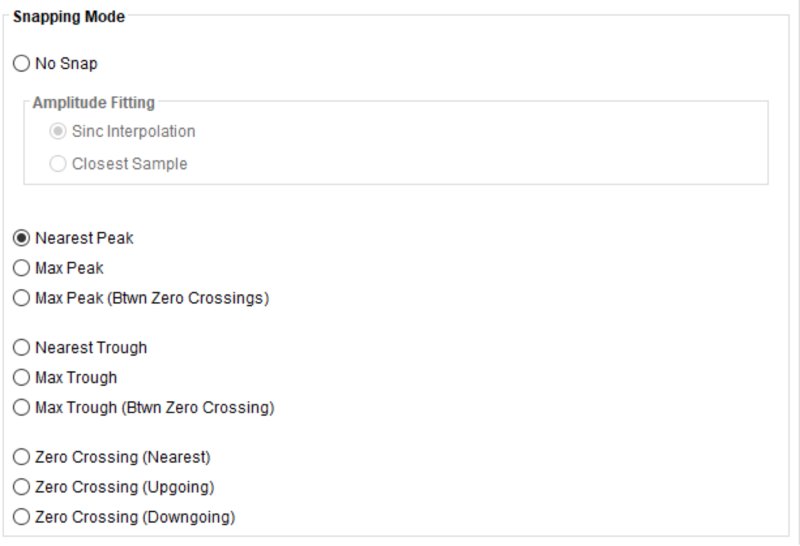 Each snapping option is detailed in the INTViewer user guide. Your picks are reflected in real time in all windows, including 3D windows. A 3D window next to a 2D window where an horizon is picked. Which brings me to this new INTViewer feature. Picking in 2D is a tedious activity. A faster way to pick a full volume is to use the built-in horizon interpolation. This interpolation uses the Natural Neighbor algorithm to propagate existing picks into a full surface. This is an option accessible from the contextual menu of an horizon layer. Another often overlooked feature of INTViewer is the attribute extraction. 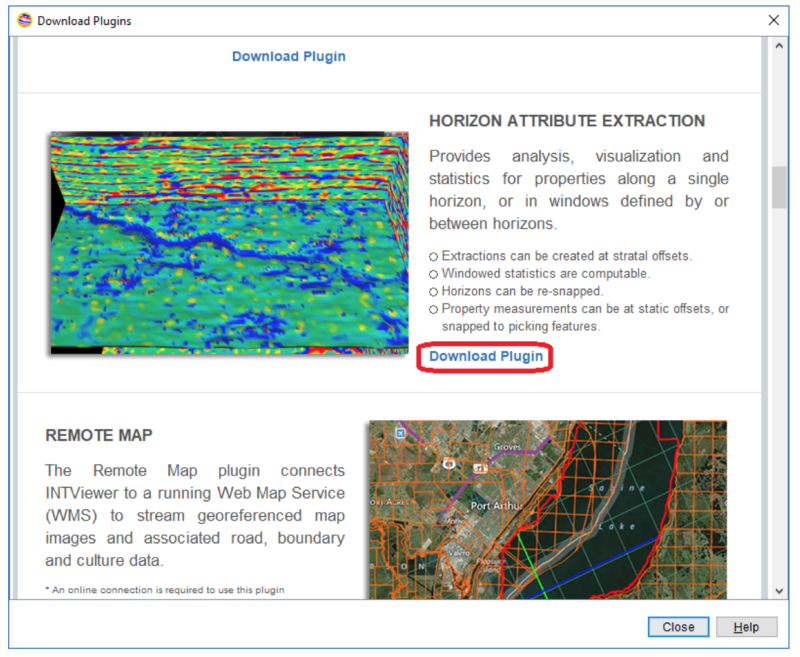 Download the Horizon Attribute Extraction plugin from the Plugin Store to benefit from this feature. Click the highlighted link to install this free plugin. The horizon extraction is also accessible from the contextual menu of an horizon layer. 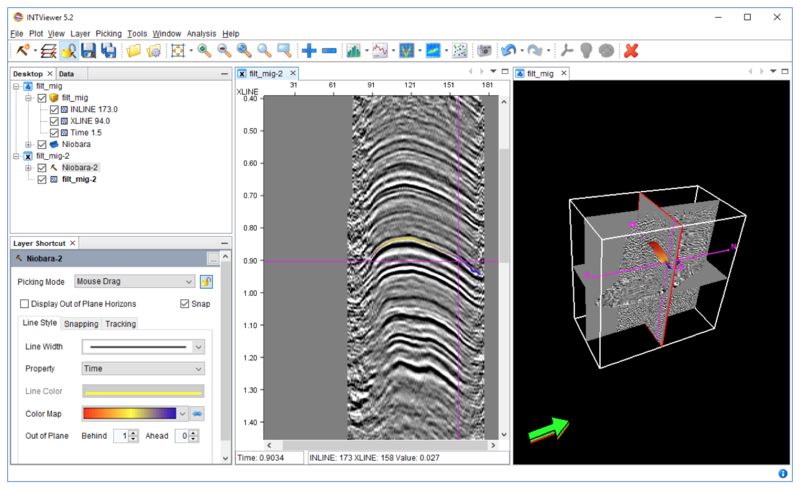 This is a tool with numerous options, useful for 4D analysis. As this is an operation that is typically applied to multiple datasets, it is scriptable in Python. 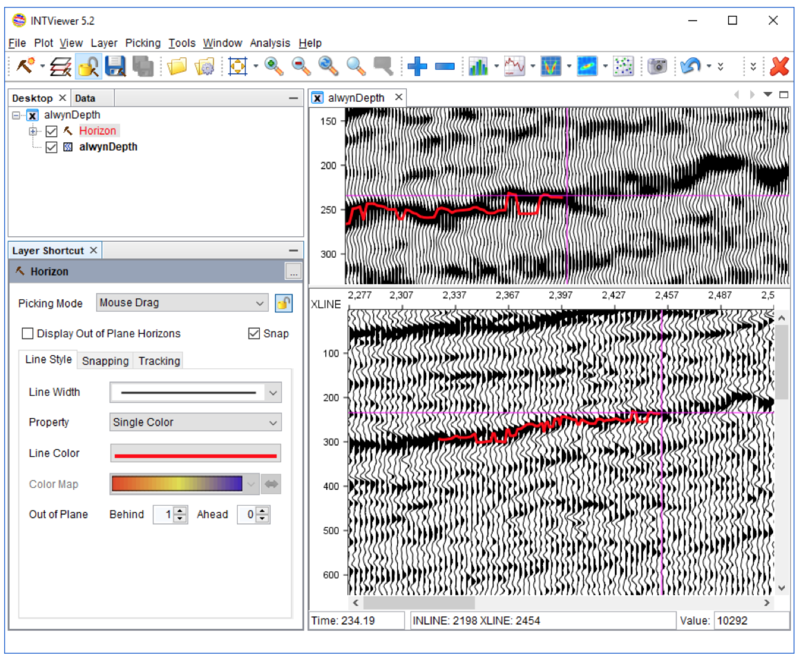 INTViewer will create Python scripts for you based upon your extraction parameters. The Horizon Attribute Extraction dialog. There are a few features not included in this tour: A calculator is available to combine the attribute of several horizons with a mathematical formula. Formulas can also be applied to trace headers to create header horizons. Contact us for more information on horizon picking!